The Hindu Marathas long had lived in the Desh region around Satara, in the western portion of the Deccan plateau, where the plateau meets the eastern slopes of the Western Ghats mountains. They had resisted incursions into the region by the Muslim Mughal rulers of northern India. Under their leader Shivaji, the Maratha freed themselves from the Muslim sultans of Bijapur to the southeast, and became much more aggressive and began to frequently raid Mughal territory, sacking the Mughal port of Surat in 1664. 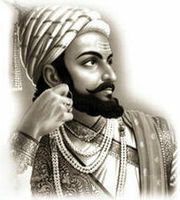 Shivaji proclaimed himself emperor (Chhatrapati) in 1674. The Marathas had spread and conquered some of central India by Shivaji's death in 1680. But later lost it to Mughal rulers and to the British Empire.